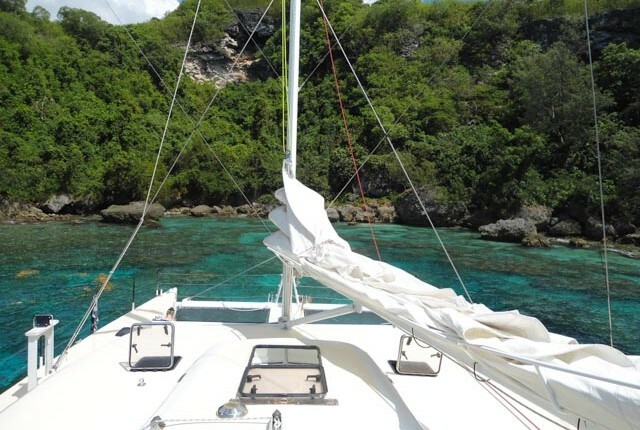 Sail to Mele Bay on ‘South Sea Vagabond’ a 18 meter catamaran for a spectacular day on the water. 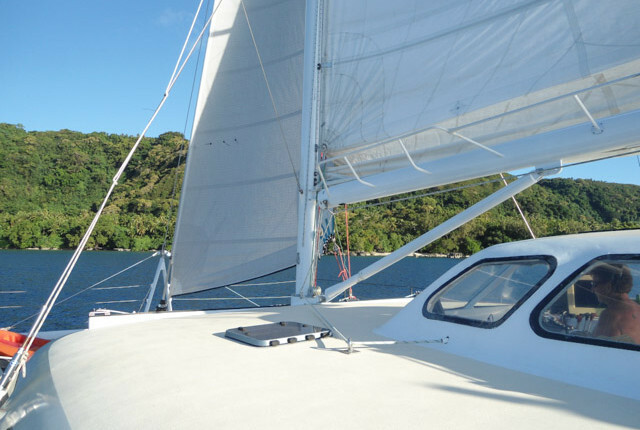 Experienced New Zealand skipper Simon and his crew have been sailing the waters of Vanuatu for years and know the area well. Whichever way the wind is coming from they will make sure the sails are set for a good sail. You will board Vagabond at the Larva Lounge dock in town town Port Vila at 10 am and you will be taken by the tropical breeze along to Mele Bay. 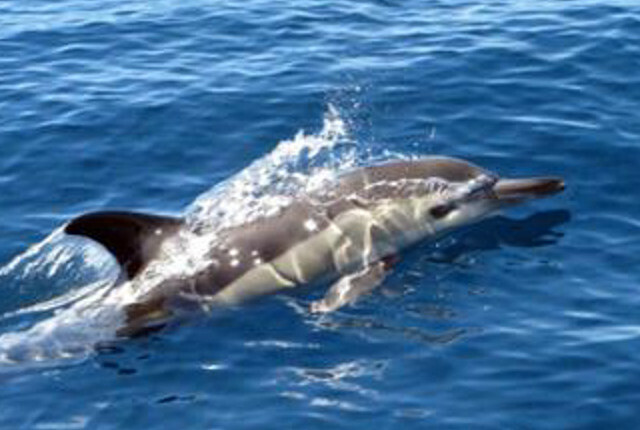 Once in Mele Bay you can enjoy the guided snorkel in the famous marine sanctuary surrounding Mele island. Watch the tropical fish darting in and out of the colourful coral. Alternatively relax on Mele beach take a swim off this lovely stretch of sand. 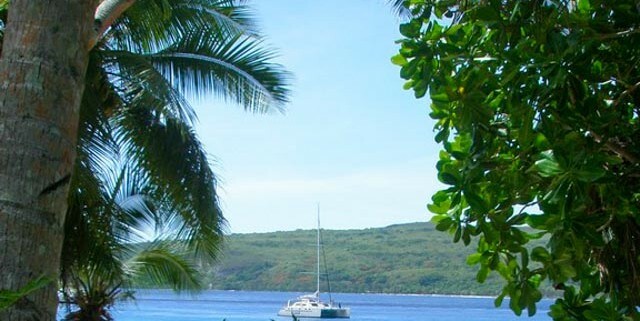 Lunch at the Beach Bar tops off a spectacular morning and in the afternoon you will sail back to Port Vila to arrive back a the dock by 4pm. Time on the boat is approximately 10 am to 4pm. Pick up from Hotels in Port Vila at 9-9:30 and returns at approximately 4:30 (in plenty of time to re-board the cruise ship for ship passengers). Meeting point for cruise ship passengers is at the Lava Lounge dock in down town Port Vila. Please note there are minimum numbers for this tour to go ahead. If, on the rare occasion, there are less than the minimum number of people booked you will be contacted to change the day or if that isn’t possible you will receive a full refund. Free use of snorkel gear. Bathers, togs or whatever you would like to call your swimwear! 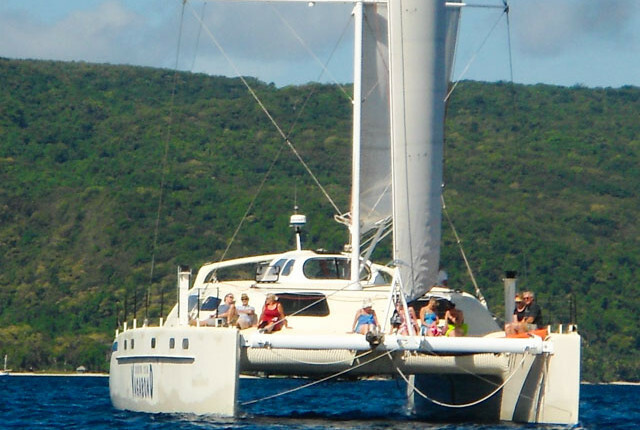 Vagabond is an 18m catamaran built to stringent New Zealand survey requirements. Fully licensed in Vanuatu and to carry 50 passengers. For Cruise ship passengers the meeting point is at the Larva Lounge Dock. It is an easy taxi ride or an even easier water taxi hop across the bay from the cruise ship wharf. Hotel guests staying in hotels in the Port Vila area will be picked up from the hotel between 9 and 9.30 am.